Poor academic preparation may be a big challenge for poor students who struggle in college, but another important barrier is “social isolation and alienation”. The effort to increase the number of low-income students who graduate from four-year colleges, especially elite colleges, has recently been front-page news. But when I think about my students, and my own story, I wonder whether the barriers, seen and unseen, have changed at all. It’s often a struggle for poor students just to gain admission to college, but once on campus their background can create another challenge to graduation. But once those from lower socioeconomic backgrounds arrive on campus, it’s often the subtler things, the signifiers of who they are and where they come from, that cause the most trouble, challenging their very identity, comfort and right to be on that campus. The more elite the school, the wider that gap. I remember struggling with references to things I’d never heard of, from Homer to the Social Register. I couldn’t read The New York Times — not because the words were too hard, but because I didn’t have enough knowledge of the world to follow the articles. Hardest was the awareness that my own experiences were not only undervalued but often mocked, used to indicate when someone was stupid or low-class: No one at Barnard ate Velveeta or had ever butchered a deer. A related factor is the alienation from their families, who may not be fully supportive of the distance and growth these students have chosen. One low-inocme, first-generation University of Chicago student wrote poignantly about the social isolation that almost derailed her graduation. Affordability is only part of the problem. … My scholarship opened the doors for me, but it didn’t see me through my four years here. Adult mentors can help, and the Posse Foundation goes a step further by creating a supportive peer group. Vicki Maddensept, “Why Poor Students Struggle”, New York Times, September 21, 2014. In his book Falling Behind: Boom, Bust & the Global Race for Scientific Talent, author Michael Teitelbaum challenges the commonly held belief that the United States suffers from a shortage of STEM workers. The truth is that there is little credible evidence of the claimed widespread shortages in the U.S. science and engineering workforce…. Although some STEM fields are booming and employers find it difficult to fill professional positions, by no means is that true across the board. Teitelbaum lists five episodes of STEM ‘“alarm/boom/bust” cycles since World War II’ where in all cases government policies intended to address false claims of shortages only exacerbated the problem. … Each lasted about 10 to 15 years, and was initiated by alarms of “shortages,” followed by policies to increase the supply of scientists and engineers. Unfortunately most were followed by painful busts—mass layoffs, hiring freezes, and funding cuts that inflicted severe damage to careers of both mature professionals and the booming numbers of emerging graduates, while also discouraging new entrants to these fields. The current administration has fallen into the same trap, pushing for more STEM graduates who may actually find jobs in short supply. This year New York began allocating taxpayer funds to encourage college students to pursue STEM majors. Ignoring “science-based evidence” produces “large unintended costs”. George Leef is another critic of these government interventions. … Strong business and educational groups lobby for nice-sounding policies that benefit themselves, frequently employing dubious arguments and misleading claims. The costs of the resulting pro-STEM policies are dispersed among the public, and fall particularly hard on the unfortunate individuals who invest a lot of money and years of their lives in pursuit of credentials that are apt to become almost worthless. Michael S. Teitelbaum, “The Myth of the Science and Engineering Shortage”, The Atlantic, March 19 2014. George Leef, “True Or False: America Desperately Needs More STEM Workers”, Forbes, June 6, 2014. Which colleges meet full financial need? Only 62 colleges will meet 100% of a student’s demonstrated financial need. Of the 1,137 colleges and universities that submitted financial need data to U.S. News, just 62 of them cover full need. Many of these schools rank high, with about one-third placing in the top 10 in their categories. Among them are Princeton University and Williams College, ranked No. 1 among National Universities and National Liberal Arts Colleges, respectively. Just three public schools are included on the list that meet full financial need. The complete list of schools can be viewed at the U.S. News website. Amid a national debate about the worth of a college education, a respected annual poll about the education views held by Americans has found that only 44 percent of Americans now believe that getting a college education is “very important” — down from 75 percent four years ago. …. 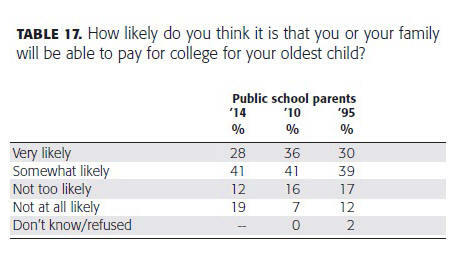 Similarly, in 2010, 77% of parents said it was somewhat or very likely that they would be able to pay for college for their oldest child. That percentage declined to 69% this year. Interestingly, confidence in being able to pay for college dropped down to the same level seen in 1995 after rising in 2010. 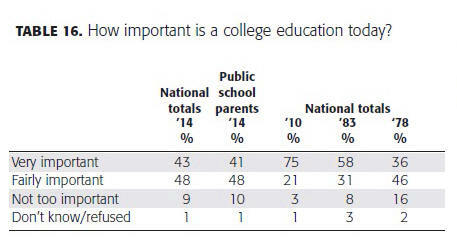 I will be on the lookout for an update to the 2011 Pew Research survey that found 80% of parents believed paying for their child’s education is an extremely important (35%) or very important (45%) goal. Valerie Strauss, “Poll: Most Americans no longer think a college education is ‘very important’”, Washington Post, September 16, 2014. Education is the second-most-popular category on GoFundMe. … GoFundMe and other sites, like Crowdrise, let individuals pursue personal fund-raising. You create a profile, including a photo and an explanation of what you’re seeking the money for, and then spread the word on networks like Facebook and Twitter. Crowdrise’s chief executive, Robert Wolfe, said his site had recently added an option for individuals — rather than recognized charities — to raise funds and that the educational category is growing…. Neither GoFundMe nor Crowdrise independently verifies the claims made in profiles. Since most donors are friends and family, low-income students often find it challenging to raise substantial funds. Another barrier is that contributions to individuals are not eligible for tax deductions. Other similar sites, like ScholarMatch, use more stringent criteria and do not allow donations to specific individuals. A dramatic story helps raise more money. For students who are willing to share their stories, crowdfunding seems like a no-brainer. Given that young people seem eager to share many details of their personal lives online, I can see how this idea will continue to grow. Ann Carrnssept, “That Selfie Is So Good, It Could Help You Pay for College”, New York Times, Sept. 11, 2014.